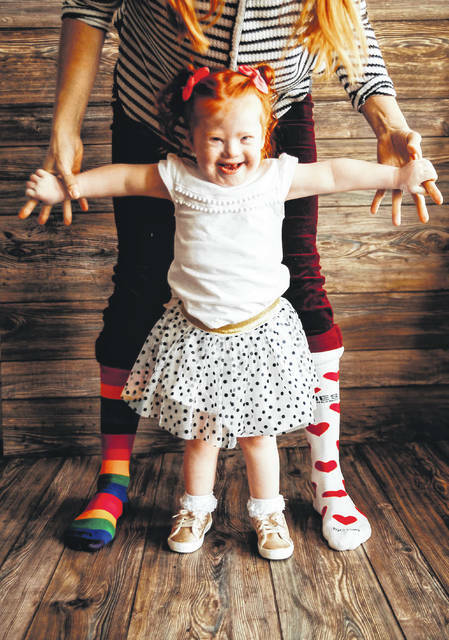 Gia Casiano, 2, of Sidney, enjoys celebrating World Down Syndrome Day with her mother, Julie, who wears mismatched socks for the occasion. 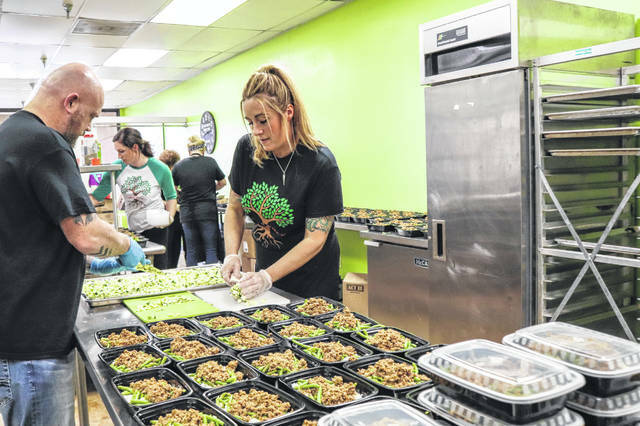 Joe Casiano, left, and Julie Casiano, of Sidney, owners of The Meal Prep Life, and their staff prepare meals for 180 people recently in their new, commercial kitchen in Sidney. SIDNEY — A little more than two years ago, Julie Casiano, of Sidney, and her husband, Joe, had a baby, Giavanna, who was born with a heart defect and Down syndrome. Julie had been working part time as a bartender and wanted to find a job that would allow her to be at home with Gia. “I meal prepped at home,” Casiano said. She would spend a whole day cooking meals for the week. And they were healthy meals because she was trying to get back in shape after her pregnancy. So she floated an idea on Facebook: “I took a picture of what I’d made for myself and put it on Facebook. Would anybody pay for somebody to meal prep for them?” she asked. She got some positive response so the next week, she devised a menu and listed it online. “This is what I’m going to make. If you want this, pick it up on Sunday,” she posted. Seven people did. “I thought, ‘Wow, seven people want me to cook for them,’” she said. That was two years ago. Today, the Sidney-Shelby County Chamber of Commerce cut a ribbon to open The Meal Prep Life’s new commercial kitchen in Sidney. At the end of February, Joe quit his job as a manager at Eugenitics Aerospace in Huber Heights to work full-time with his wife. And the two of them, along with a crew of helpers including Julie’s sisters, Joe’s mother, their teenage daughter and several friends regularly make up to five meals for each of 180 people a week. “It comes from putting family first, giving our kids a lifestyle where mom and dad are both present. That’s priceless to us,” Casiano said. She was thrilled that, coincidentally, the ribbon-cutting ceremony for their business fell on World Down Syndrome Day. “You celebrate by wearing mismatched socks,” she said. There is nothing mismatched about The Meal Prep Life, however. The business has mushroomed (no pun intended) because the Casianos supply tasty meals using only fresh ingredients at a reasonable cost. The meals are individual portions; however, family meals are also available. The individual meals are sold in packages of five or 10. Five meals cost $45; 10 meals cost $85. There is also a weekly snack — protein balls are a big hit — or a breakfast option each week. There are also dairy-free and gluten-free options. The menus are calorie- and carbohydrate-conscious, Casiano said. Purchasers can find the week’s menus on the Meal Prep Life’s Facebook page and can join the Meal Prep Life group page. Casiano posts the menus on Wednesdays and closes the page down when the number of orders reaches her staff’s sell-out point. That usually happens within a few hours. Patrons can pick up their fully cooked meals at the kitchen, 1544 Michigan St., on Sundays from 4:30 to 7 p.m. and Mondays from 9 a.m. to noon and from 5 to 7 p.m., in the Miami Valley Centre Mall parking lot in Piqua on Sundays at 6 p.m. and in the church parking lot in McCartyville on Sundays at 8 p.m. The clients come from throughout Shelby County, Piqua, Troy, Minster and beyond. “I travel every Sunday with excitement to pick up meals for the week ahead. I am a busy entrepreneur and run a nonprofit in spare time. I do not like to cook and live my healthiest best life when I plan ahead, and getting my foods from the Casiano family now for nearly a year has helped tremendously for my husband and me, saving us the cost of eating out and not knowing the quality,” wrote Sara Cardone, of Lima, in an email. All the fresh meals can be eaten within five to seven days, or they can be frozen. The family meals come frozen. A recent week featured chicken salad with grapes and walnuts over a mix of spring greens; Chinese green beans and turkey with a homemade Asian sauce over Basmati rice; loaded taco salads with southwestern skinny yogurt dressing; bunless turkey burger with bacon, lettuce, tomato veggie pasta salad; and slow-cooked balsamic chicken with roasted red potatoes drizzled in olive oil and seasonings and a side of veggies. There is no added butter or salt. The meals are provided in microwavable, dishwasher-safe containers that can be returned to Meal Prep Life for reuse. The snack offering was fresh apple slices, a fruit and nut mix and cheese cubes. The protein balls were oatmeal chocolate chip cookie with dried cranberries and a hint of cinnamon. Casiano comes by her health-consciousness naturally. She grew up eating healthy meals prepared by her mother, Terri Steenrod. She designed a logo that pays tribute to her late mother. It features a tree in full bloom. She and Joe decided to “dive in,” she said without a clue about how to open a business. They got a lot of help from the Sidney-Shelby County Health Department whose staff walked them through what they’d have to do to get the proper permits and to pass inspections. Now fully operational, the business provides a service to people who are too busy to cook or who just don’t like to. “Convenience is the key. Eating healthy is not easy to do. This is not a diet or a quick fix. Eating healthy is a lifestyle change. We are happy to make that lifestyle change easy and more convenient for busy people,” Casiano said. Jason R. Jones, of Sidney, owner of Big Four Cross Fit, said his clients have discovered the Meal Prep Life. “I can say that the service they offer has helped a lot of our members. CrossFit isn’t just about excercise, it’s about lifestyle. Our daily nutrition is just as important as our daily training. The Meal Prep Life has made it easier for our athletes to stay on top of their nutrition, and the results have shown up both inside, and outside, of the gym,” he said. Casiano hopes to have a website soon, through which people can order meals. In the meantime, the Facebook page suffices. She spends hours and hours devising menus, shopping for ingredients and bookkeeping, beyond the time it takes to prepare the food. “I was getting really overwhelmed,” she said in talking about why Joe decided to join the business. Now they are eager to see where it all may lead them.